Massive Blackout Rocks Brazil - Joe.My.God. An estimated 50 million people in the southern half of Brazil are without electricity tonight as the massive blackout has triggered crime alerts in several states. The country’s largest cities, including Sao Paulo and Rio de Janeiro among others, were left with no illumination or traffic lights due to the outage late Tuesday, which the energy ministry said was caused by an undetermined problem at the country’s biggest hydroelectric plant, Itaipu, on the border with Paraguay. One radio station, Bandnews, said an estimated 50 million people — one quarter of Brazil’s population — were affected. The blackout hit at 10:15 pm (0015 GMT Wednesday). The southern states of Sao Paulo, Rio de Janeiro, Minas Gerais, Espirito Santo, Mato Grosso do Sul and parts of the central state of Goias and the federal district of Brasilia were plunged into night. Police in Sao Paulo and Rio called on the cities’ residents to not go out into the darkened streets to avoid the risk of accidents and an upsurge in already prolific street crime. Off-duty and vacationing officers were told to report to their posts. In Sao Paulo and its suburbs, an agglomeration of 20 million inhabitants, streets were illuminated only by the lights of cars and from a few buildings — including hospitals — that had their own generators. Just three days ago, CBS’ 60 Minutes reported that a similar blackout in 2007 was created by computer hackers, a claim hotly denied by Brazilian investigators. 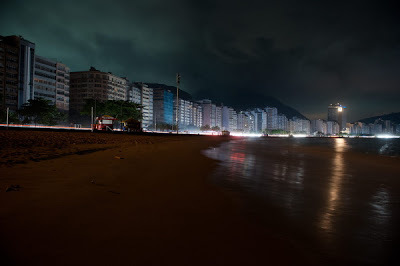 BELOW: Twitter user RodrigoBNO sends out this shot of Rio’s Copacabana beach.